Dedicated to my art teacher, Cheryl Champagnie. From Thursday, the calls and text messages started coming in to me from my young friend who is nine years old and in Grade 4. His Visual Arts homework was to list occupations in the visual arts, tools of a visual artist, and to give examples of different types of art. My friend knew his limitations, and the text messages were to who he knew could give him help. When he visited, I set a lightly varnished 35 cm" wooden statue on a table to inspire him to find the right words for the assignment. The artist had chiseled a standing woman balancing a full basket of ground provisions on her head. It had been in the house for more than 50 years and belongs to my mother-in-law who bought it on a cruise ship stop in Haiti. 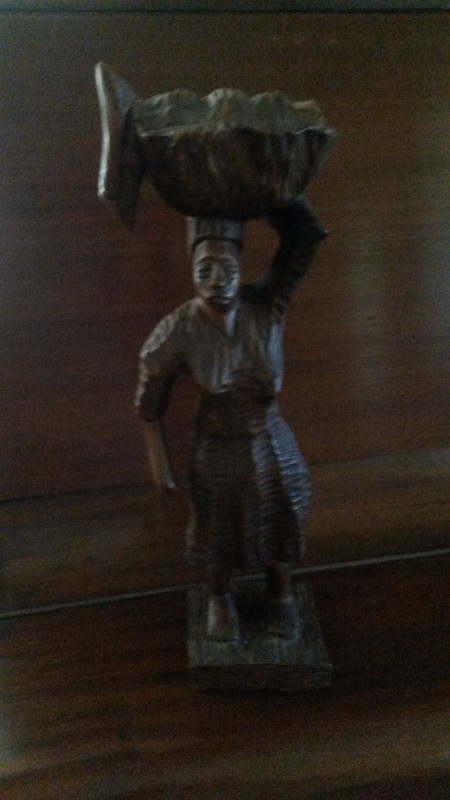 There is a carving of about the same size in my parents' house that was also made in Haiti, but that statue is unvarnished, and the woman is in a squatting pose holding her head. I also own a polished Lignum Vitae carving of a woman, but mine was done here in Jamaica. The figure is bending backwards. Women bearing real and mental burdens, and contorting themselves are all around me. 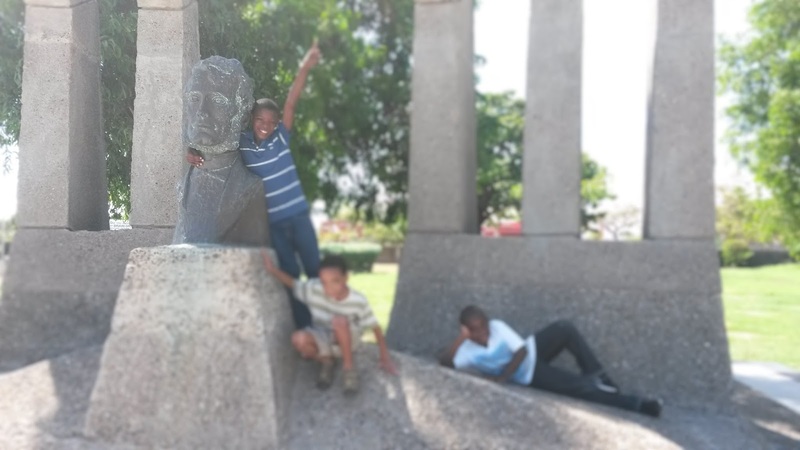 The following day, I took my friend and two younger boys on an excursion around Kingston to look at statues. My goal was to raise awareness of the materials that make statues and the subjects of the statues. It was the last Sunday in the month, so the National Gallery of Jamaica was open and the boys would have a wider variety of objects to see. I put chilled Capri Sun drinks in my lunch bag, planned a route, and in good spirits we set out at about high noon. The first object was a great way to introduce the concept of a bust. It is of King Edward VII and he is set on the Half-Way-Tree clock tower facing West. He is a bust on two accounts: the sculpture of him in ceremonial dress ends at his chest, and his face is busted because his nose was smashed off some time ago. The king died in 1910, the bust was installed in 1913 and the inscription says he was called The Peacemaker. Less than a year after that, Jamaican men joined UK forces in the opening stages of the Great War which was from 1914-1918. The second statue caused unstoppable laughter in the car even before it came into view at the ceremonial entrance of Emancipation Park. I tried to be heard above the glee. 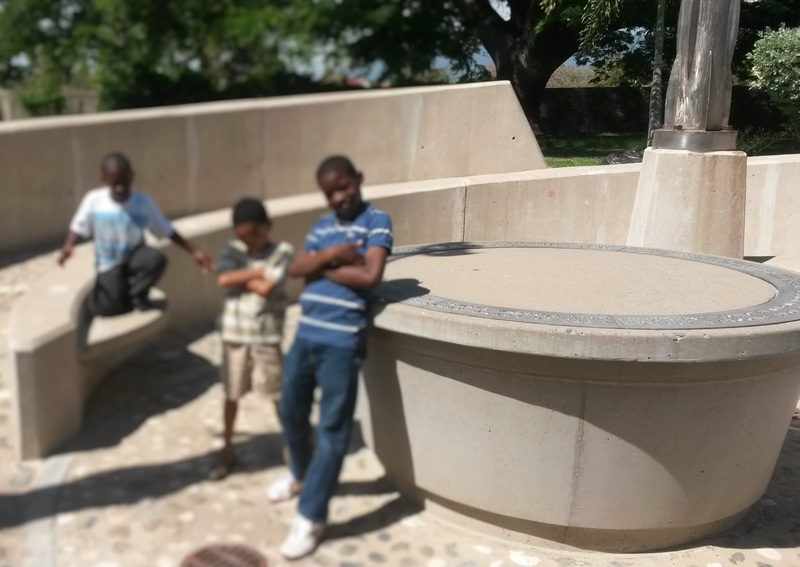 "The people in this statue represent the condition of our enslaved ancestors. They had nothing, but once they had their freedom they set the foundations that built our nation." The boys were looking at the fronts of the naked torsos as I spoke. I drove on another 1.5Km. "Look to your left," I said, you will see a statue on a building. This kind of statue is called a relief. It is mounted on the wall. What is it about?" "Adam and Eve!" The answer comes quickly when the design features a man, a woman and a snake beneath a male authority figure. There was a follow up question from a boy. "The Little Theatre" he said, reading the sign on the building. "Is this where they have the Shebada shows?" "I do not know if those shows are performed here," I answered. "So you is a man or a woman?" "Me deh pon di border line," is well known by Jamaicans. "Now look to your right across the road", I invited, and gave the description myself, "There is Jesus on the cross." The cross is flanked by two female figures who will be his mother the Virgin Mary, and his friend Mary Magdalene, and the trio is painted in silver. This marks the graveyard of the Franciscan Sisters of Allegany, and the schools that they founded and their convent adjoin it. Then I pulled over to the left curb and invited them to look left again. "This is the Jamaica Library Service headquarters, and that is the bust of a very famous man who you will hear about one day. He is Mahatma Ghandi. He was famous for being a leader in his country, India, and he wanted change to happen without violence." I left it there and continued on our journey. "I know the children's hospital," said the Grade 4 boy, the reason for the season. "You went there when you got sick once?" It was then that it finally registered with me that he had been coughing since he got in the car. The air conditioning was not that high, just enough to keep us cool. I turned it off and opened the windows to let in natural air. He quietly reversed my actions. "Now we will see what is probably the most famous statue in Jamaica. I wonder what that is?" Then we rounded the corner and there was screaming in the car as the statue appeared. I parked behind it and we all tumbled out and confirmed that the statue was made out of metal. Nothing much more can be said. It is a realistic statue of Bob Marley playing a guitar. We drove another 4Km where I pulled over to the left curb again. They easily read the name at the base of the statue and it is only now that I realise that I missed an opportunity to introduce the word plinth into their vocabulary. "In Spanish they call his first name SI'mon. At one time, much of the people of South America were under the rule of others who lived far away. Simon Bolivar was a leader for the liberation of South America. He had many enemies and is life was in danger, so he came here to Jamaica for awhile and wrote some important documents. When he had his forces organised, he went back home and he and his team were successful in gaining independence for the countries listed on the sign. The people of those South American countries were grateful to Jamaica for giving their hero refuge, and they put up this statue to honour the time that he spent here." So there is joy again to get out and look around a new space. After a minute, we continue down to the National Gallery some 2Km away, and at the door I gave a briefing beside the statue that is placed on the ground outside. It is of two female figures kneeling. The older seems to be giving guidance, or perhaps gentle correction, to the younger, whose face is slightly turned away from her mentor. The boys were resting their arms on the statue, or knocking to figure out the material it is made from as I issued my commandments. "Don't run in the building, don't touch anything in the gallery, stay close to me...."
An attendant opens the door and comes out and speaks directly to the boys. I had not thought that a concrete statue at pedestrian level on a the public sidewalk would be off grounds to touch, but that is how it is. We go inside and the exhibition on is Young Talent 2015. There is general ambivalence for the realistic paintings, and interest in the textile sculpture, photographs on mixed medium and assemblages. Then we go into the Historical Galleries. They put a foot in, then back out and nearly fall down laughing, and seem to me a bit nervous. Having had a recent experience with taking a child to a site of murders and which is presumed haunted, the Rose Hall Great House, I decided to be protective so gathered my arms around them. "Be calm as you go inside, if you are frightened, just stay close to me and remember, it is not real." They shrugged me off and went inside the room and squealed and laughed and pointed their fingers and generally made me nervous. Two young men came in and one said, "I feel like doing that myself, but can't because I am not their age; I would look ridiculous." Inside the room were wooden carvings of human heads by father and son David Miller Senior and David Miller Junior. They are oversized and highly polished and this made a big impact on the boys. I asked them what they thought, but could not get an answer. At the next collection of statues, the reactions of the boys became even less coherent. It was the wooden carvings by Kapo, an artist who sculpted in wood, was a painter, a spiritual leader, and a man who was very connected to his sensual side. His carvings will fire up some kind of imagination. The piece in the centre of the room is a rooster about 1.5 metres tall. Our exploration of the gallery allowed us to identify carvings in stone, concrete sculpture, canvas paintings, videos on digital tablets, photography on acrylic , and an iron implement of torture. The less literal the painting or sculpture depicted reality, the more it seemed to hold the attention of the boys. What they liked they reached out to touch. I also paused to exchange pleasantries with a former schoolmate, who is now an architect and interior designer. She was touring the gallery with her teenage daughter and six-year-old son. He could not resist holding hanging textile art that resembled a ball. A gallery attendant followed us as discreetly as he could during our time there. I guess he, like myself, had visions of what happened in Taipei when a boy tripped and tore a hole in a 300 year-old painting. We visited the gift store where my charge covered his nose. The aroma from scented candles and the coffee shop was too much for him. We then went to the harbourside and they drank Capri Sun. By chance, a commercial jet was taxiing at the Palisadoes airport across the harbour, so they watched it turn, speed up and take off. Two of the three had never seen a takeoff before, and they were thrilled. Then we walked over to the spot where swimmers gather, and they were suitably impressed by boys their age diving off the sea wall into the dark, deep, choppy seawater. Leaving downtown, I went around Parade, the ring road in the centre of historic downtown, so that they could see the statues of two national heroes, one at the North and the other at the South. I also pointed out the Ward Theatre and said that this is where Shebada had definitely performed. I went to one of those performances and the 800-seat theatre was packed, but I did not stay to the end. It was my second attempt to see that show, the first was at an open-air venue in Portmore which seated about 2,000 patrons, and which also had a capacity crowd that night. My reasons for early departure on both occasions was the behaviour of the audience. I believe that I would not have been able to sit with Shakespeare's patrons when he was alive. "Why they turn the statue that way with the back?" I was not sure how to answer why the statue of Queen Victoria has her back to the street, so just gave information that it was a statue of a former queen and that at some time it was decided to turn the statue to face inside the park and not the street. My answer did not satisfy the questioner, but he did not seek to clarify the mystery any further. During our visit in the gallery, my student repeatedly asked for a statue or a painting of Nanny of the Maroons, Jamaica's only National Hero who is a woman. I did not see any in the gallery, so decided to add the National Heroes Circle to our visit. The Jamaica Defence Force was in rehearsal for the visit of the Prime Minister of the United Kingdom, so I entered the park from the North East entrance by the Ministry of Finance and Planning. We passed tombs of former prime ministers and a few other cultural leaders. My charge was coughing, but said that he was comfortable to walk, so I slowed down the others and we visited all of the graves and cenotaphs in the National Heroes Circle enclosure. He was still disappointed because Nanny was not buried in the park, and the monument to her did not include a physical representation of a woman. He wanted to see a face and an attitude and clothes, perhaps like Bob Marley or Simon Bolivar. A realistic depiction is what he wanted to connect him to his favourite hero. 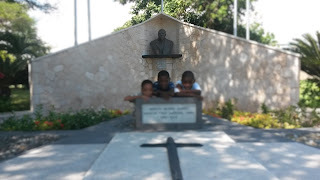 The Marcus Garvey tomb, which has a bust and a recognisable likeness of Marcus Garvey, was a highlight of the visit, and, with no prompting from me, they individually venerated him. The final tomb we visited was Norman Manley's which is outfitted with relief statues made out of bronze. One of the reliefs has a human head above a slim, elongated, naked female chest, and at the bottom are three human heads. The metal is of course dull from exposure to the elements except for the perky, almost pointed, breasts which are shiny. Tentatively at first, checking in with me with a glance, hands reached out and did their bit to keep the twins polished. We left thirsty and I stopped by the vendor at the West side of the park to get us some coconut water. The boy from the country and I were happy to drink straight from the nut, the other two remained in the car thirsty, not caring at all to partake of that insipid drink; I relented and they got Pepsi that released a glacier of drink when they were opened. We were all refreshed in our own way. What were the lessons learned in two and a half hours? We had no discussions about the subject matter of statues. We did not describe the works that we saw. They asked no questions about the time period in which the art was done or the names of the artists who imagined them. As the adult, I hope that the small wooden carvings, including women at work and the oversize heads awaken ideas about loveliness. I hope that they will remember the name Mahatma Ghandi and Jesus Christ and be encouraged that peace and non-violence are high values that they too can adopt. I hope that the heroic stance of Simon Bolivar brings forward thoughts of friendship, and that leadership is about service. I hope that the statue called Redemption Song, and the tomb of Marcus Garvey and the monument to Nanny and the other heroes will build self-confidence. I hope that the peacemaker king with no nose, and a queen with her back to the street awakens a general curiosity about the world around us. Whatever may be our individual memories of that day, I can say with confidence that we had an afternoon enjoying each other's company sightseeing our capital city. This is a short story about my life, and it is moments like these that inspire my writing of novels.